EXPEDIENTE DE DECLARACIÓN DE RUINA EN LA CALLE LA PAZ Nº 11. EXPOSICIÓN PÚBLICA PADRÓN FISCAL DE TASA POR SUMINISTRO DE AGUA POTABLE Y SANEAMIENTO, 3º TRIMESTRE DE 2017 (ZONA 1). APROBACIÓN INICIAL DE LA ORDENANZA REGULADORA DE LA CONCESIÓN DE SUBVENCIONES A LAS URBANIZACIONES DEL TÉRMINO MUNICIPAL DE MAELLO. BASES DE LA CONVOCATORIA DE SUBVENCIÓN MEDIANTE RÉGIMEN DE CONCURRENCIA COMPETITIVA PARA LA REALIZACIÓN DE PROYECTOS DE CARÁCTER DEPORTIVO DE ESPECIAL RELEVANCIA EN LA PROVINCIA. SOLICITUD LICENCIA AMBIENTAL PARA LA INSTALACIÓN DE EXPLOTACIÓN DE GALLINAS, CABRAS Y OVEJAS. 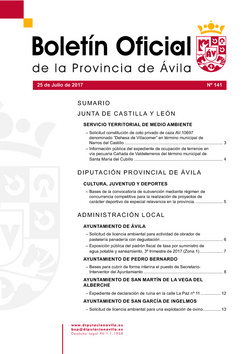 INFORMACIÓN PÚBLICA DEL EXPEDIENTE DE OCUPACIÓN DE TERRENOS EN VÍA PECUARIA CAÑADA DE VALDETERRENOS DEL TÉRMINO MUNICIPAL DE SANTA MARIA DEL CUBILLO. SOLICITUD LICENCIA AMBIENTAL PARA ACTIVIDAD DE OBRADOR DE PASTELERÍA PANADERÍA CON DEGUSTACIÓN. MODIFICACIÓN ART. 3 DE LA ORDENANZA REGULADORA DEL PRESIO PÚBLICO POR ABASTECIMIENTO DE AGUA.